Well, here we are. The last day of 2014. It sounds like a bit of a cliché, but time really has flown. I think the older you get, the faster it goes, and I can’t believe that’s another year of with already. I’ll do another post soon, looking forward to 2015, but today I want to take a look back at this year. Naturally, this post is littered with links to posts from throughout the year. I’ve said before, that New Year seems a little daft in some ways; it is just another day after all. But there’s nothing wrong with pausing to take stock of your life so far, and have a think about where you want it to go in the future. A lot of fairly exciting stuff happened to me this year. 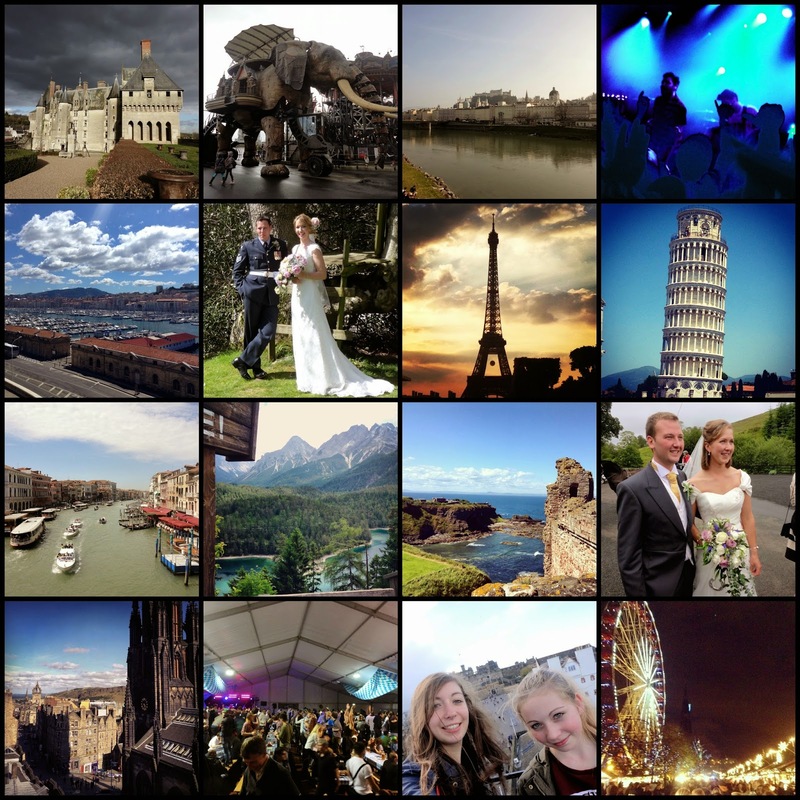 The highlight, without a doubt, was my ‘European Escapade’ trip with Contiki in June. It was crazy and hectic and a total blast from start to finish, with an amazing group of people. Travel has always been high on my wish list, and this was my first big solo trip. There’s plenty more of the whole I want to see, but that trip was one I’ll never forget. I also started this year living in France, on the second half of my year abroad. I had mixed feelings about that year; it was tough back in the beginning, and I certainly didn’t love it like others did. However, things got easier as it progressed, particularly in the second semester. In particular, I loved how much it let me travel. I took a trip to visit a friend in Austria, and spent two weeks travelling through the south of France in April, as well as visiting plenty of the châteaux in the Loire Valley. I also visited Paris for two cracking concerts in March; Fall Out Boy, a band I grew up with who I’ve always wanted to see, and You Me At Six, my absolute favourites, who I’d seen before, but never that close up in a venue that small. Over the summer, I worked at a summer camp that I did last year too, which is fun, but a lot of hard work. I did get to spend a week at one of the English sites, so I got to go on a few new trips. I also made plenty of time to check out shows at the Edinburgh Fringe Festival. The summer also saw two of my cousins get married, which was fun, seeing as I don’t attend a whole lot of weddings. I got to spend a weekend away for the hen do of one of them, which was very silly! There certainly wasn’t a lot of time to relax this summer! Autumn saw me return to my usual university schedule in Edinburgh. Life has been a bit quieter since then, as I have to buckle down to work, since it’s my last year of university (yep, 2015 will include my graduation!). I have squeezed in a couple of fun things though, like Edinburgh’s version of Oktoberfest and going to the Scotland vs Argentina international rugby match. December got especially stressful, with exams and deadlines, followed by extensive preparations for Christmas. I have been able to relax over the past few days though, before 2015 kicks off and life gets crazy again! In terms of goals and last year’s resolutions, I’ve done not too bad I think. My main resolution last year was to write more, and with an average of three blog posts a week all year (with daily blogging in June, but a couple of missed dates here and there), I think I’ve done not bad! This year has seen a whopping 161 posts, more than I’ve ever done before. My creative writing (novel attempt) has been a little slower, but I have successfully undertaken a MuggleNet internship and am now a full staff member as a journalist with them, which is good practice! My other goals were to eat better and exercise more; I started the year well on these, but got slack over the summer, with my trip and the camp, then never really got back to it. A lot of people think I’ve lost weight though, which I’ll take as a win, though my fitness levels could still be better. As with every year, I’ve grown up more. France and my summer job have forced me to become more independent and more confident, things I’ve always tried to work on. I used to be a very quiet kid, which has changed a lot over the past years. I was also pretty brave on my trip; bobsledding wasn’t something I thought I’d ever do! I’ve got plenty new experiences under my belt, and they’ve fuelled my desire to do even more in the future. 2014 was by no means perfect - nothing ever is - but it has given me plenty of good memories to look back on. Here’s to 2015 being even better! Well done on keeping resolutions, you don't hear many people doing that! Hope you can continue your winning writing streak in 2015!